Caterina Gobbi | What time are you performing tonight? Save Event: Caterina Gobbi | What time are you performing tonight? Share Caterina Gobbi | What time are you performing tonight? transmitting waves in the aether. the vocal fold to vibrate. ‘What time are you performing tonight?’ dedicates itself to four composers who have shaped the development of early electronic music in Italy: Teresa Rampazzi, Daniela Casa, Ingrid McIntosh, and Maria Teresa Luciani. Their sounds find their way into the exhibition, so do bits and pieces of their histories - or rather what is left of them. Absence as a state or condition in which something is expected, wanted and searched for, yet untraceable or simply not present, becomes an object of different shapes during the exhibition. As a topic of investigation it manifests through the design of a speaker, through the adaptation of a daily object into a visual trope, through the formation of a sound. There is Maria Teresa Luciani’s famous soundscape of an imagined utopian city, Daniela Casa being one of the major figures of Piper, the first club in Italy; there is Teresa Rampazzi composing less and less after her husband passed away and there is nothing but Ingrid McIntosh’s name in a book written by Pietro Grossi about avant-garde music in Italy. For ‘What time are you performing tonight?’ Caterina Gobbi created a new body of work that explores electronic music historiography through the use of DIY electronic technologies. Interested in the way in which we consume music predominantly through electricity, each speaker signals the dependence of the sound it transmits to the way it is designed. The entire installation consists of four speakers, each dedicated to one composer. Together they highlight aspects from the women’s lives or music - at times fictional rather than factual - and investigate issues of absence vs presence, lack vs visibility through sonic compositional and technological design combined. 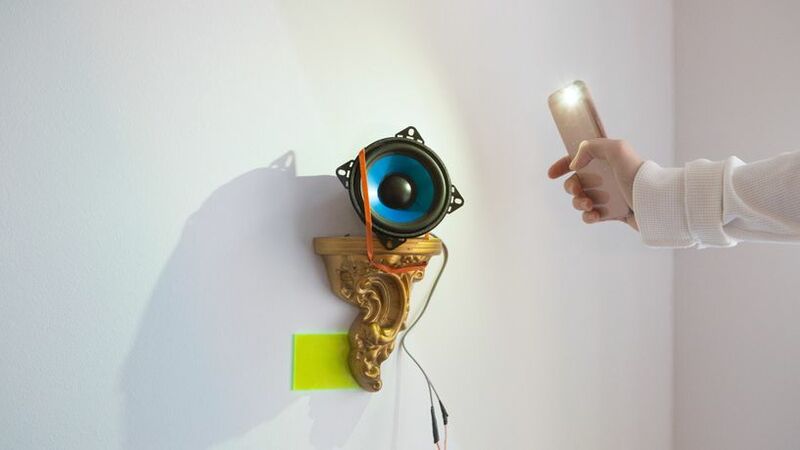 The speaker objects are continuously performing during the exhibition. At certain times they will be taken over by Urban Arts Berlin, a Berlin-based radio and collective, Autogenesis Magazine, telling narratives from the third space, TAKE ME ON PODCAST by Leila Arenou, Oona Linke and Laure Jaffuel, and DJ collective Synaptic Island and the participants of their listening session. For the closing event of the exhibition MADAM will inhabit the speakers with an improvised nomadic sound performance. A small publication brings together contributions by Claudia Attimonelli, Autogenesis, Frances Morgan, Nina Power, Salomé Voegelin, Andrea Riosmay, Laura Zattra.